The town of Macclesfield in Cheshire has a group of four fascinating museums which explore the history of silk. 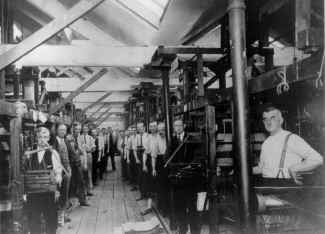 The photograph archive houses over twenty thousand photographs relating to the silk industry and Macclesfield. All the Macclesfield mills are featured, with external and internal views in most cases. In particular shots were taken of many of the manufacturers in 1933. There are also many photographs of the local area and examples of costumes. Macclesfield Silk Museum, within the heritage centre, holds various documents in its archive in connection with businesses in the silk industry. For example there are nineteenth and twentieth century letters and other documents originally belonging to silk manufacturers, silk printers, textile designers and pattern cutters.